simply put, is web programming. We make websites perform tasks and functions that standard design does not allow. We write the code that you do not see when a button is clicked. 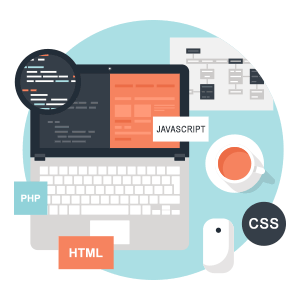 Our specialty is PHP (Hypertext Preprocessor) and SQL (Standardized Query Language) with a concentration on MySQL (which is an open source SQL). We also work with Ruby on Rails (“RoR” or Rails”) which is an object-oriented programming (OOP) language. WordPress is our most common framework for web design and is built with PHP and uses a SQL database to store information. WordPress can often be used "out of the box" for everything a website needs, but when extra functionality is needed, that goes beyond the themes and plugins available, we step in and add the functionality to new and existing WordPress websites. We create secure, solid, uncompromisable code for our clients. Your revenue and our name are on the line.